(Sept. 6, 2016) The Portland Bureau of Transportation on Wednesday will begin booting vehicles that have orders to tow issued by Multnomah County Circuit Court. What’s the current process for towing vehicles due to overdue citations and fees? The Multnomah County Court generates a “tow list” of vehicles with orders to tow issued by the court. The list is sent to PBOT parking enforcement and if they come across a vehicle that is on the list, PBOT contacts the contracted tow company and the vehicle is towed. On Aug. 3, 2016, the City Council gave PBOT code authority to “immobilize” vehicles for booting. Instead of towing the vehicle right away, it will be booted for up to 36 hours. This gives people the opportunity to see a judge, make payment, or set up a payment plan before they accrue the additional charges associated with tows. How does a vehicle get on the tow list? Vehicles that have unpaid parking citations and fees totaling more than $500 and/or six delinquent citations are put on the tow list by the Multnomah County Court. How is the Multnomah County Court involved? As a result of legislation from the 1970s, Multnomah County Circuit Court handles all of the City’s parking and traffic citations. How much does it normally cost for tow and storage? The current contractual cost of a tow is $168. The cost to store a towed vehicle past the initial four hours is $25 per day. Is there an additional booting fee? A booting fee is not currently proposed. How long will boots stay on vehicles in the ROW? Boots will stay on vehicles for 36 hours before being towed. If the customer is making arrangements with the Court and more time is needed, PBOT will accommodate that. It is not the intention of PBOT to store vehicles in the ROW for a significant amount of time, however. Will vehicles accrue parking citations while it remains on the street? How do customers pay the Court or see a judge? Customers can pay the Court through the normal process in person. Payment plans can be scheduled with the Court, if needed. Customers can also see a judge at Drop in Court, Monday through Friday, from 8:30 to 10:30 a.m. and 1:30 to 3:30 p.m. without an appointment. PBOT will not boot on Fridays, to allow vehicle owners to contact the Court during normal business hours and not have to wait over the weekend to have their vehicle released. Pay, in full, all outstanding citations with cash, a money order, a cashier’s check or credit/debit card that is in your name. Payment plans may be available, if authorized by a judge. If you wish to use a credit/debit card that is in another person’s name, the cardholder must appear with you and present a valid government issued photo ID. You cannot pay for a vehicle release over the phone or online. You and the person paying for the release of the vehicle MUST appear in person at the Multnomah County Circuit Court, Parking Citation Office, Room 106, 1021 SW 4th Avenue in Portland. How will the boot be removed? 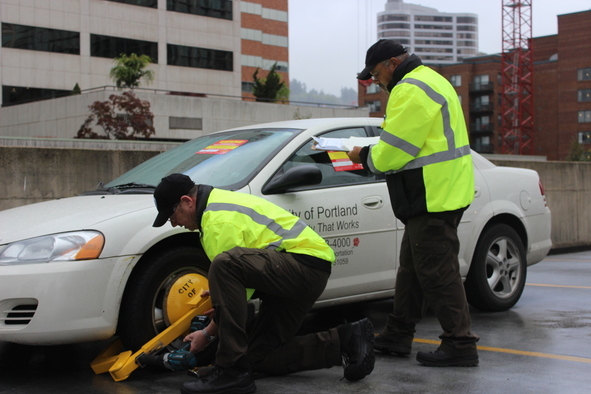 After the customer makes arrangements with the Court, PBOT parking enforcement will remove the boot immediately. PBOT projects the estimated wait time would be less than an hour. How much will the equipment cost PBOT?